Nothing says cooler weather like those amazing comfort food dinners we all love. One of these great comfort foods is a delicious soup that can help warm you up after a long, cold day. A lot of the soup recipes we love are savory, but sweeter soups can be delicious and have your family and friends coming back for seconds and even thirds! 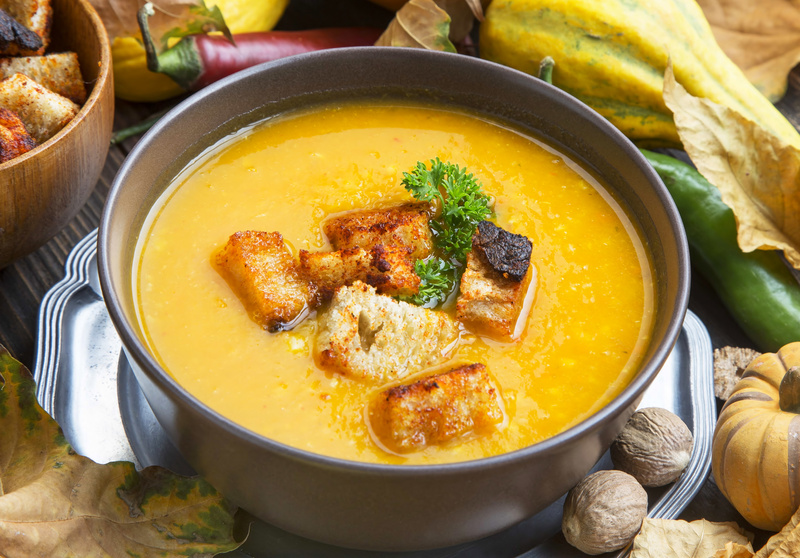 Squash soup is often a family favorite, and adding Blue Borage honey can incorporate a touch of sweetness and earthiness to make this dish unique and amazing! Clean and prepare the oven for cooking. Preheat the oven to 400 degrees. Wash, seed, and cut squash into quarters. Place the squash onto a sheet pan and brush with a small amount of melted butter. Season squash with 1 teaspoon of salt and 1 teaspoon of white pepper. Place the squash quarters in the oven and bake for 30 to 40 minutes or until they become soft and flesh is tender. Remove the squash from the oven and allow to cool slightly. Using a spoon, scoop the inside portion of the squash and remove it from the skin. Place the squash flesh into a large pot. Heat squash over medium-high heat adding vegetable broth, Blur Borage honey, and minced ginger. Bring the mixture to a simmer and cook for 8 to 9 minutes. Using a stick blender, puree the squash and honey mixture until it is smooth. Slowly whisk in the heavy cream and return the mixture to a low boil. Season the mixture with the remaining salt and white pepper as well as the nutmeg. Continue to cook until the mixture is heated through. Not only is this recipe delicious, it is also super easy to make! If you do not have a stick blender, you can also use a standard blender or food processor, but be careful! Blending hot liquids can be dangerous and it is important to make sure you are taking your time and being careful when transferring the hot liquid. If you need Blue Borage honey, you can get your order started right away and click here. Dog Injured in Hunting Accident Healing with Manuka HoneyDo African Honeybees Hold the Secret to the Colony Collapse Disorder?